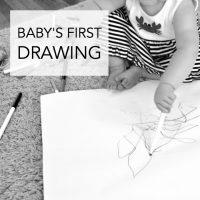 Over the years I’ve heard from so many parents and teachers who want to support drawing skills for young children with easy drawing ideas. Along with that, I’m also asked about how to support drawing skills. Follow the child’s interests. If the topic peeks their curiosity, there’s a better chance they’ll look forward to the drawing challenge. Make it fun and light and keep the pressure low. Make it playful. 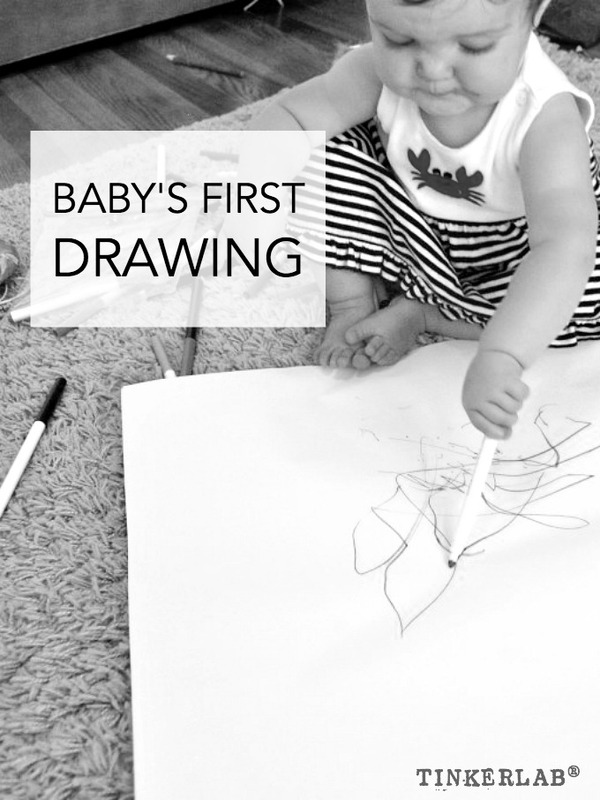 Play drawing games like playing with Art Dice or One-minute drawings. 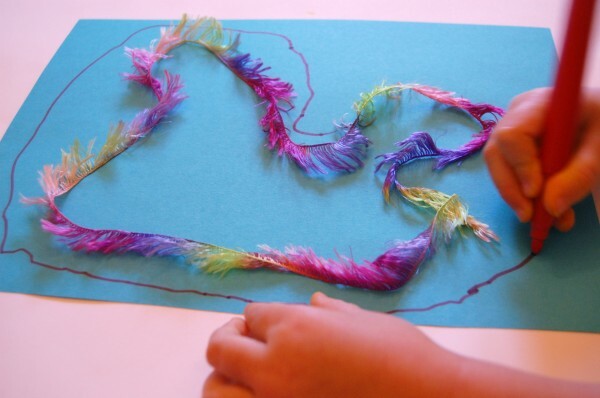 Use interesting drawing materials such as feather quills or clay. 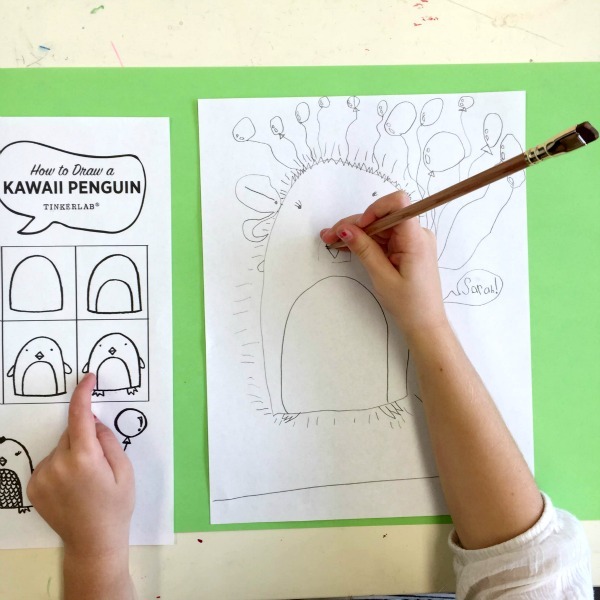 Model a drawing mindset. Show your own interest in drawing, and willingness to experiment and make mistakes. 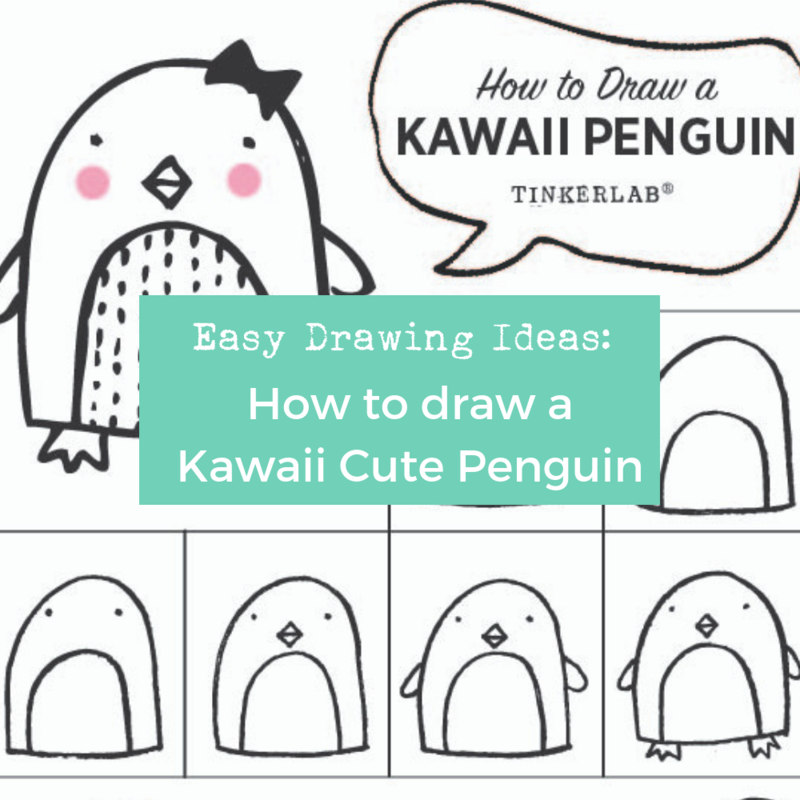 I will be the first to admit that I love cute things, and that passion has been passed down to my children who are obsessed with Japanese cartoons, Kawaii characters, Shopkins, and manga. Rather than run from this passion I decided to embrace it. Scroll to the end of this post for a link to the free printable that you can download today. 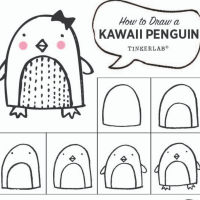 Kawaii (pronounced Hawaii) is the Japanese word for cute, lovable, and adorable. Interestingly, the word’s original meaning described someone who was blushing from embarrassment. One of the things I care most about as an arts educator is encouraging and supporting individual expression and ideas in art making. 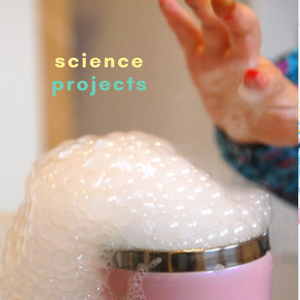 Prescriptive, how-to tutorials concern me as I worry about children taking them too literally. This process, however, should be seen as an inspirational foundation or starting point from which to build personal and unique ideas. 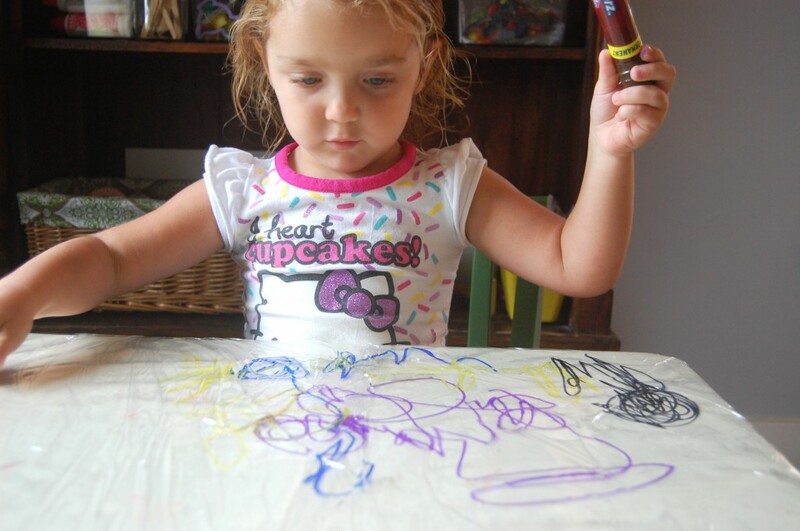 I gave the sheet to my five-year old tester, and you can see that she took it into completely original territory. 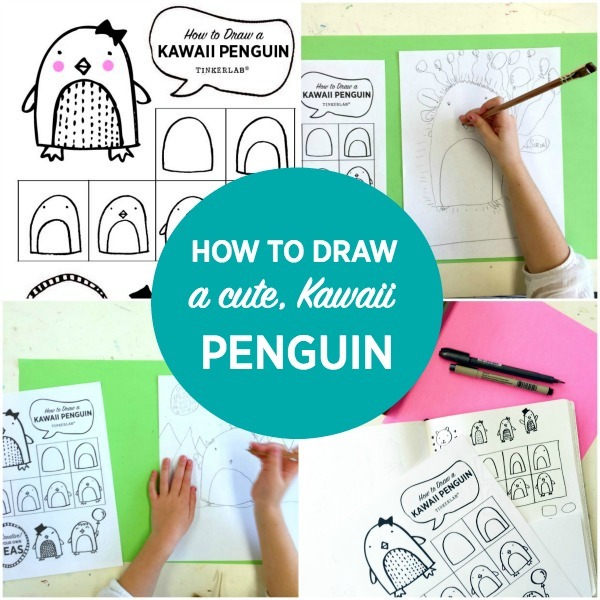 The penguin is drawn in six easy steps. Once you’re done, feel free to add your own ideas, backgrounds, textures, and props. 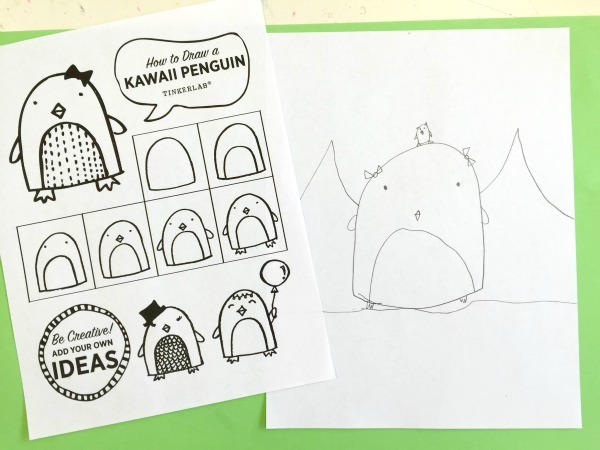 Fun drawing games are a lifesaver when you need to pass some time or want to connect with your kids on a creative level. 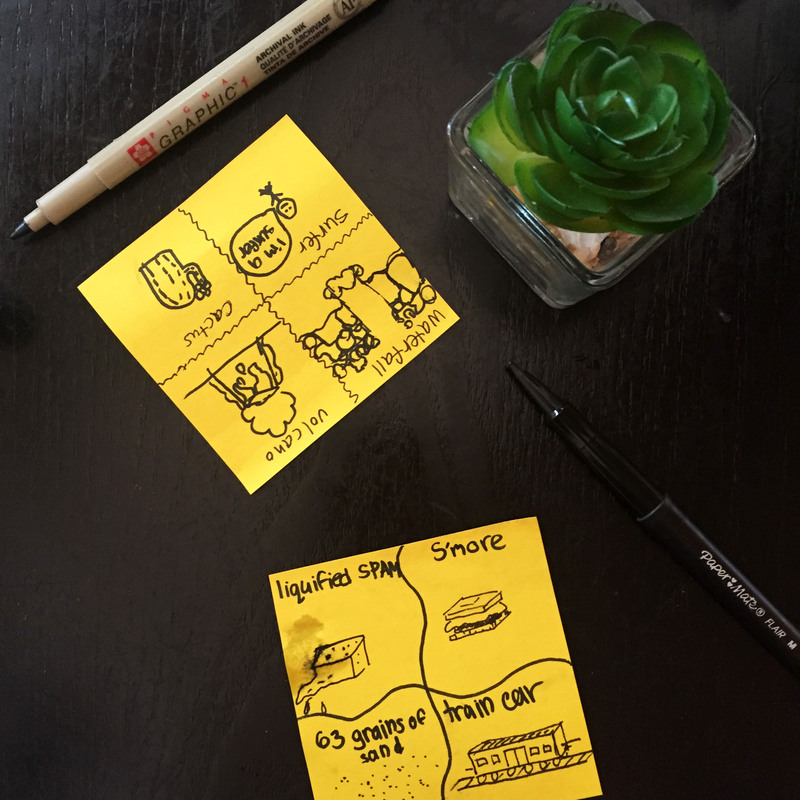 My 9-year old invented this drawing game over brunch, and it entertained the two of us for the entire meal. Dessert included. 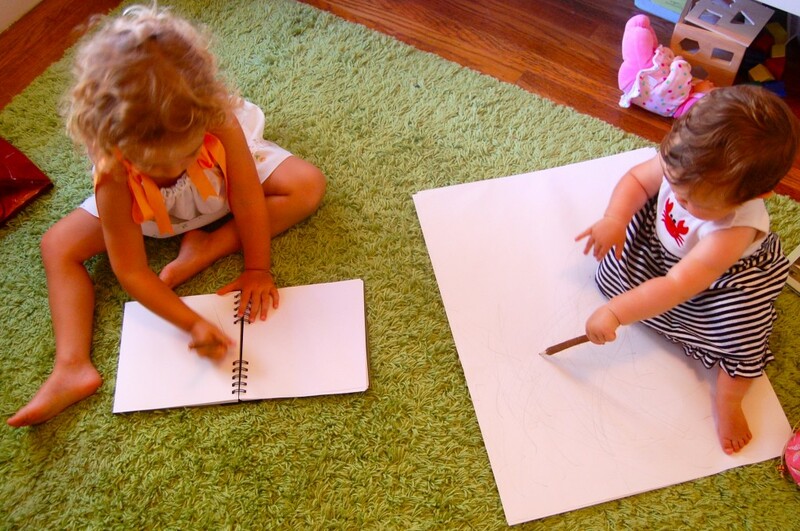 “Draw the Word” encourages imaginative thinking, writing, and playful drawing. 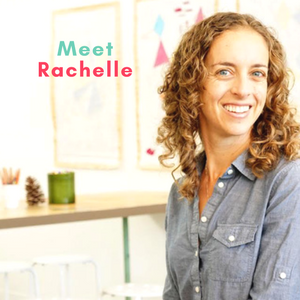 Not only is it a great exercise in creativity, but it’s also a wonderful way to connect, bond, and get to know others better. Each player divides a paper into four sections. Players switch papers and draw interpretations of the words on their new paper. Share responses and be ready to laugh and swap stories. In the following game, the themes we started with were good, plant, household item, and wild card (anything goes). I wrote the words on the left (my daughter drew the images) and she wrote the words on the right (I drew the images). Can you guess the themes in this game? 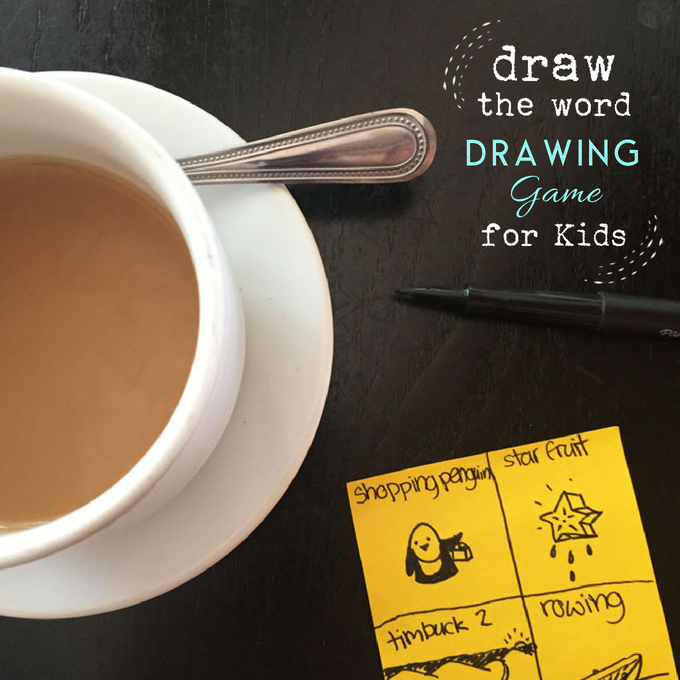 There you have it: a non-competitive cooperative drawing game that’s designed to support play and connection. 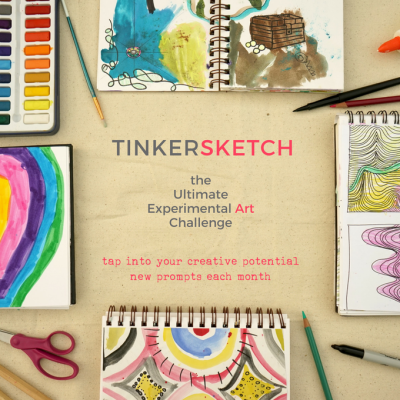 If you’re looking for more Art Games, check out our popular monthly art challenge, TinkerSketch. Each day is a different word prompt. Give yourself 5-10 minutes to interpret each prompt in a medium of your choice. For the most current challenge, go to our home page and scroll down to find this month’s challenge. Join anytime! Art Dice are one of my favorites: cover each side of a dice with different colors, lines, or shapes. Roll the dice and draw what you see. A fun exercise in serendipity and improvisation. One-minute drawings is a fun exercise. Take ten pieces of small paper and give yourself a minute to draw on each one. If you’re looking for art board games, see how you can play Cranium with non-readers and read our essential Creativity Games Gift Guide. Join me in our online art and creativity community on Facebook in Club TinkerLab. 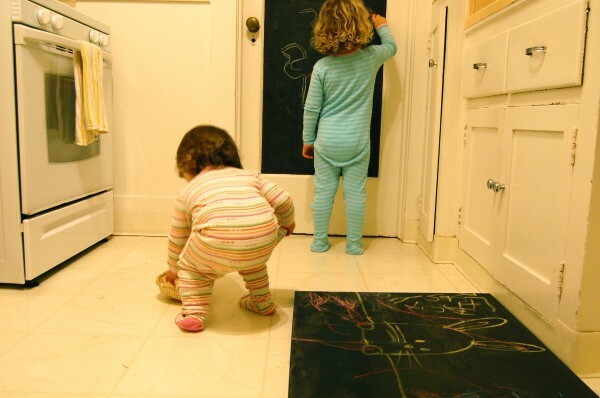 Chalkboards…I love them. You? The texture, the dust, and contrast are oh-so-appealing. When I started to see them disappear from classrooms in favor of dry erase boards, I was a little bit shocked. 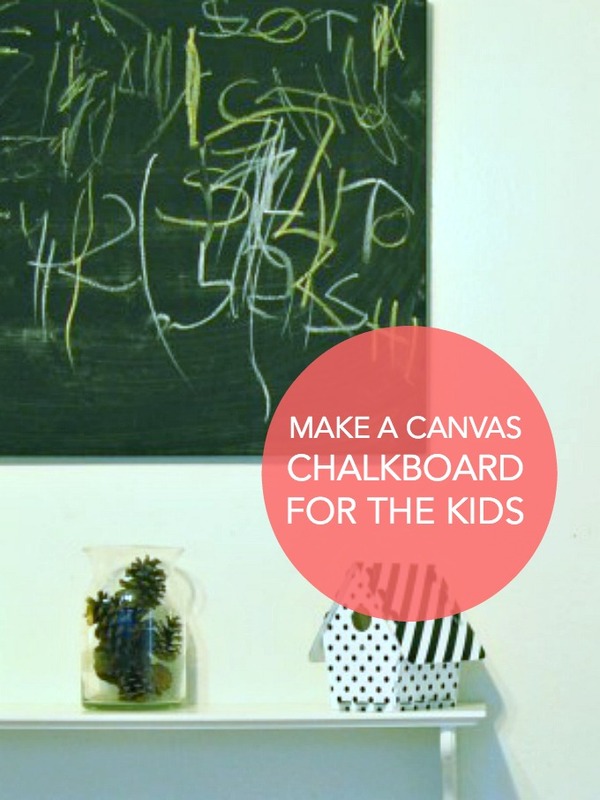 Dry erase boards are wonderful too, but they’ll never have the same rustic appeal as a chalkboard. 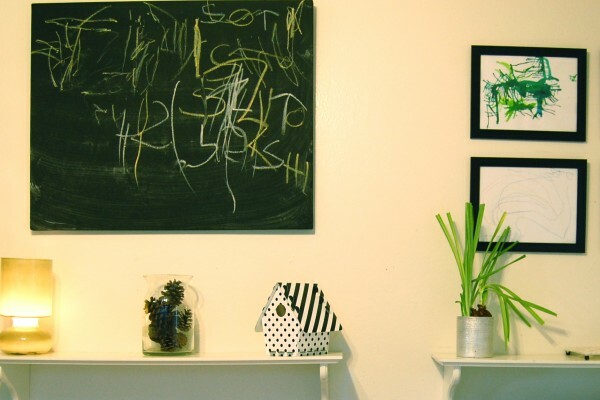 This project began when I found a $3 canvas at a thrift store back in September (it had a print of a cow on it — truly hideous), and painted over it with a few layers of black chalkboard paint. 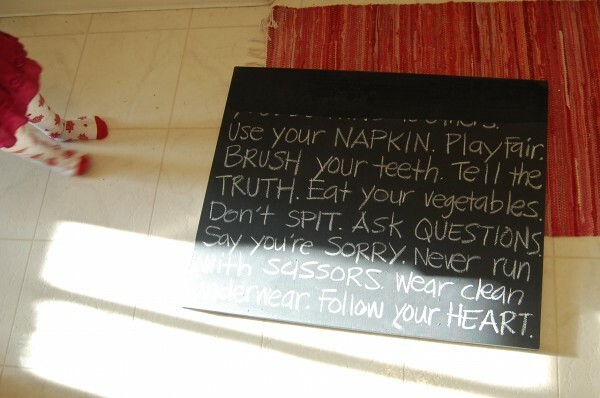 Since October, it’s been filled with these house “rules,” and while I enjoyed looking at them, and even managed to inspire a neighbor to add some chalkboard quotes to her own kitchen, I was ready for a fresh start and enlisted the help of my crew to come up with something new. And maybe I was feeling a little bit guilty on those days that I just ate buttered toast and wanted to spit. Maybe. 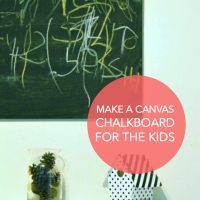 So I pulled the canvas down, wiped it clean with a damp rag, and let the kids go to town. This is how it looked two weeks ago, and then this week we started all over again. 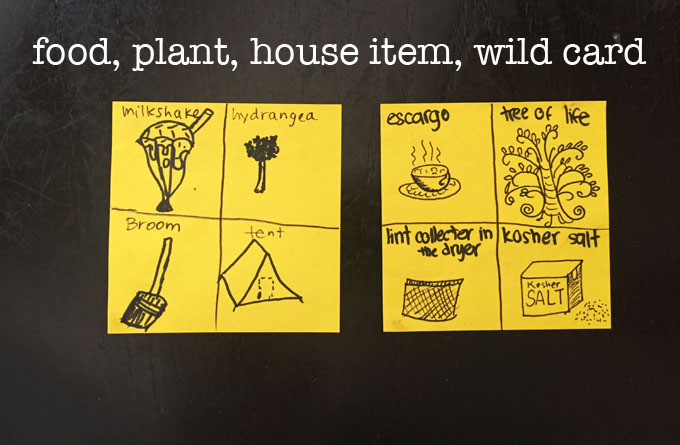 We also have a chalkboard that’s painted right onto part of our kitchen door, and it gets a lot of use for everything from chicken scratches to make-shift calendars to homemade infographics. 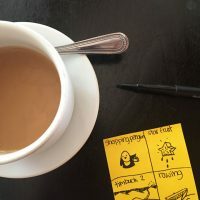 We collaborated on this one: the bunny is mine, the yellow is N, and the pink is Baby R. Funny thing, at least for me, is that back when I was brainstorming names for this blog, I called it Chalkbunny for a couple months before landing on Tinkerlab. 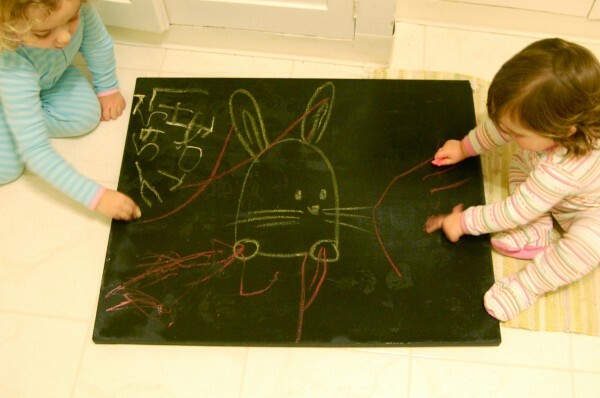 So here we have a real, live chalk bunny, which is what we decided to call the little character in my new banner. 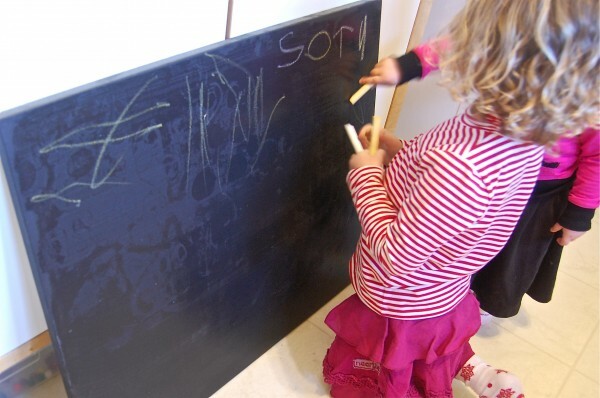 Do you have a well-loved chalkboard? What makes it special? And how do your kids use it? 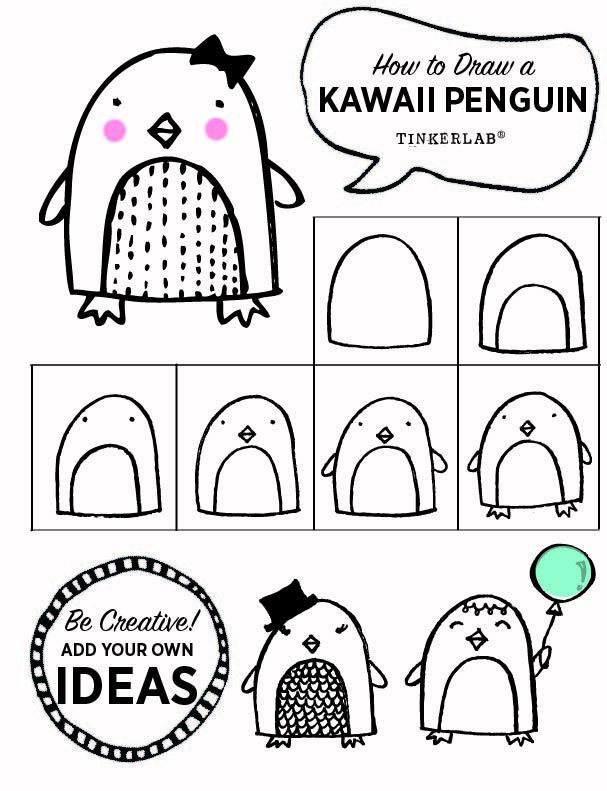 When I saw this idea over at We Heart Art, I loved it for its open-ended qualities and simplicity. 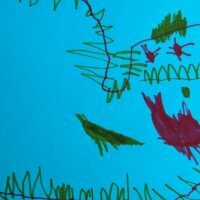 Joanna did this project with Kindergarteners, but it was adaptable to my 3-year old and could easily scale up for older children. Plus, the monster theme played out so nicely with Halloween right around the corner. Grrrrr…. And, are you ready to hear how easy this is? 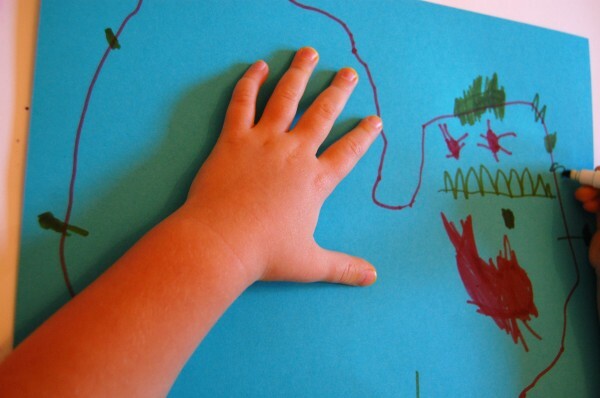 All you need are about 20″ of yarn, paper, and some markers or crayons. We talked about witches, ghosts, and jack-o’-lanterns all morning, so when I asked if N wanted to make a monster she was game. In general, she hasn’t drawn too many realistic drawings, so I was curious to see where this experiment would go. We each started out with a piece of yarn. I moved the yarn around my page to make an organic shape, connected the two ends to close it, and then traced an outline around the shape. N took note and did the same. So far, the process intrigued her. We removed the yarn and I invited her to turn it into a monster. 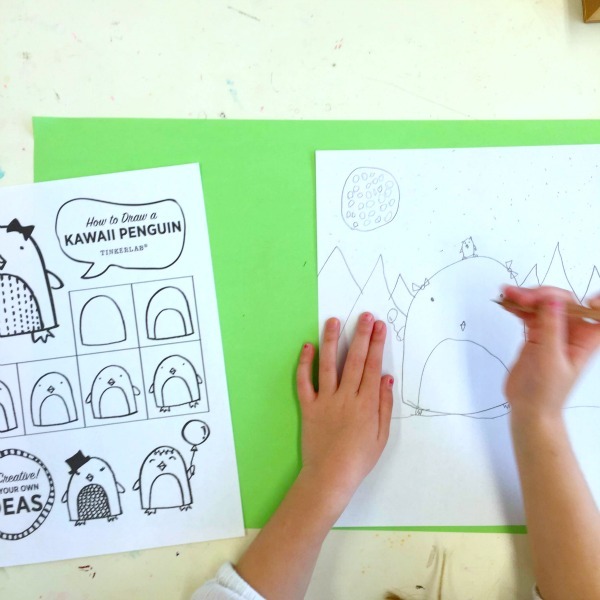 And this is what’s so cool about this project: There’s no expectation and the outcome is totally up to the child’s imagination. The red apostrophe shape she’s working on is a little baby monster. Awwww. 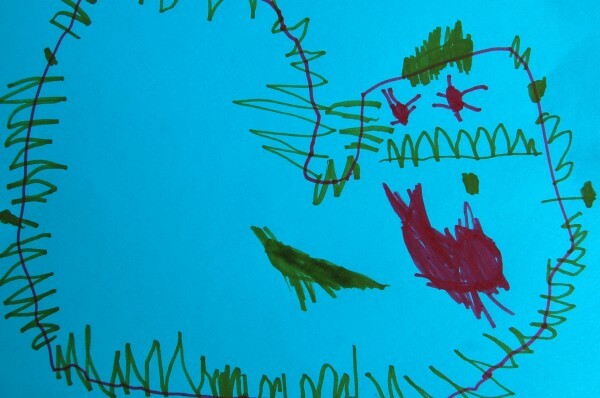 At first glance I thought it was the mouth, which is a good reminder on why it’s best to never make assumptions and ask the child about their work without making interpretations! Okay, now you can see the mouth. Ferocious! She also added some arms, eye lashes, a forehead, a belly button, and fur. It’s kind of Jabba the Hutt, no? And despite it’s obvious scariness, I love it! Have you ever heard that people learn as they teach? (In case you’re wondering, it can be credited to the Roman philosopher, Seneca — I had to look it up, and subsequently learned about it so I could share it with you!). Well, N’s friend came over the next day, and at one point in the afternoon the two of them sat down at the art table and she independently showed him how to make a monster! You can imagine my surprise and delight — I guess she really embraced the concept and thought it was worth sharing. 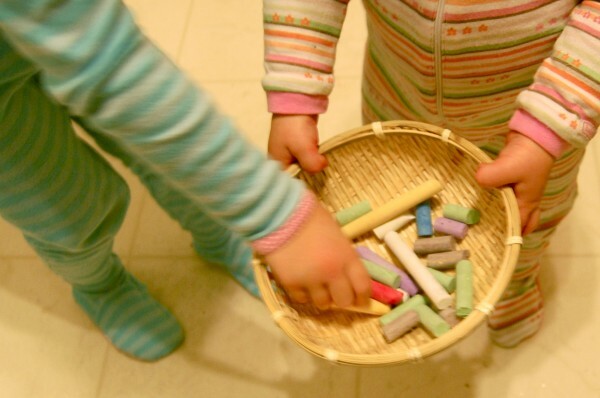 If you enjoyed this post, you have to check out 50 Simple Halloween Ideas for Kids. 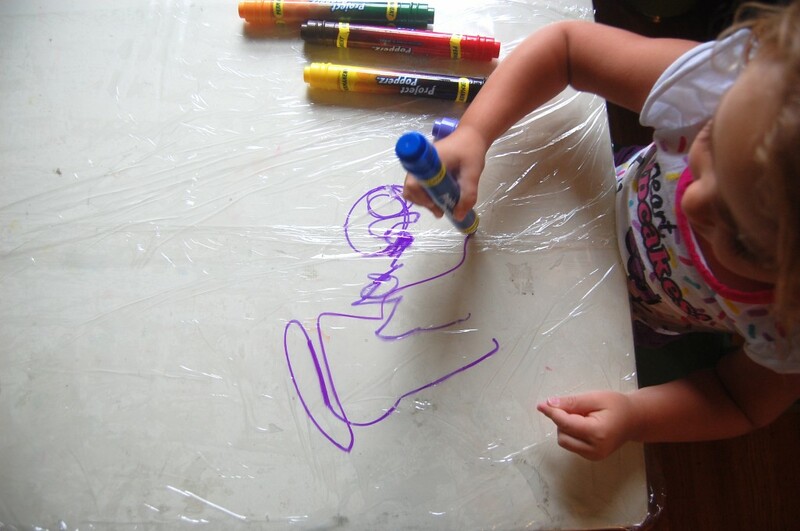 I covered her art table with cellophane, being sure to overlap the edges by a few inches so the marker wouldn’t poke through the cracks and onto the table. 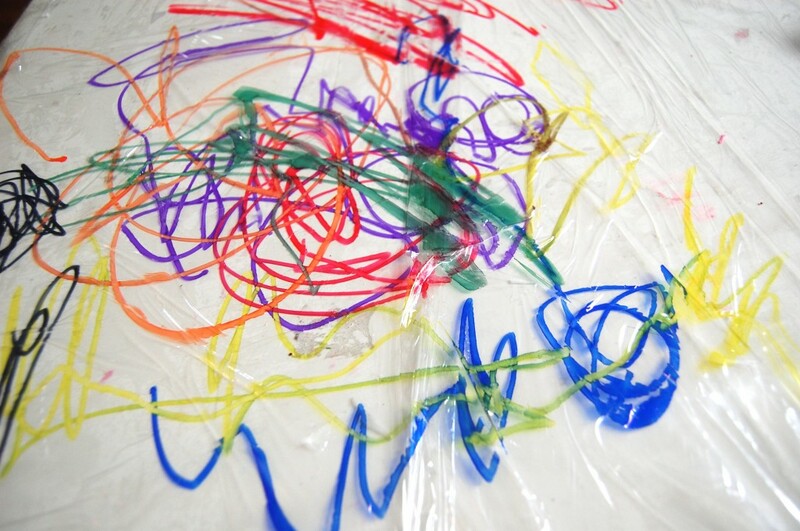 I could have done a neater job laying the Cling Wrap flat on the table to avoid all those bumps that acted like little roadblocks toward the markers. But, it still worked. Then we opened the markers and started drawing! We used every color and scribbled away until we decided to switch seats. N added more marks and then we were ready to hang it. I simply peeled it off the table and placed it right on the window. No tape necessary! 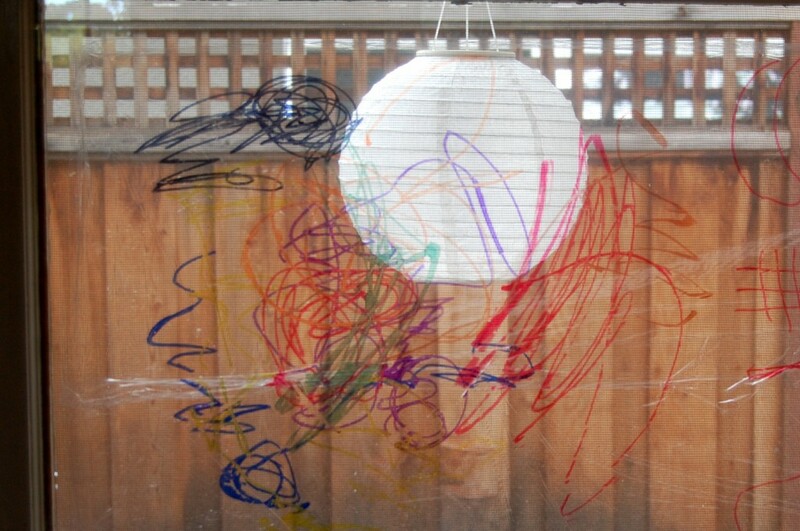 I bet you could also put the cellophane right on the window/s before drawing to give your child the opportunity to draw on the windows. That would be fun! But be sure those window are well-covered first! 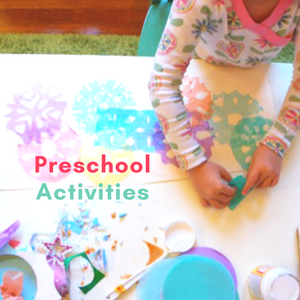 I love projects that are easy, use household materials, and change the way we think about art-making. A+ in my book! My kids just reached an age where they hang out and play together. It’s really sweet when it’s sweet, and then not-so-sweet when a civil little game of Row your Boat can turn into vigorous rowing that capsizes the boat and knocks the baby overboard. Or something similar. But here we had a nice afternoon that was full of sketching for everyone, or at least that’s the way I remember it. My memory isn’t so hot these days and the reality is that all hell may have broken loose moments later. 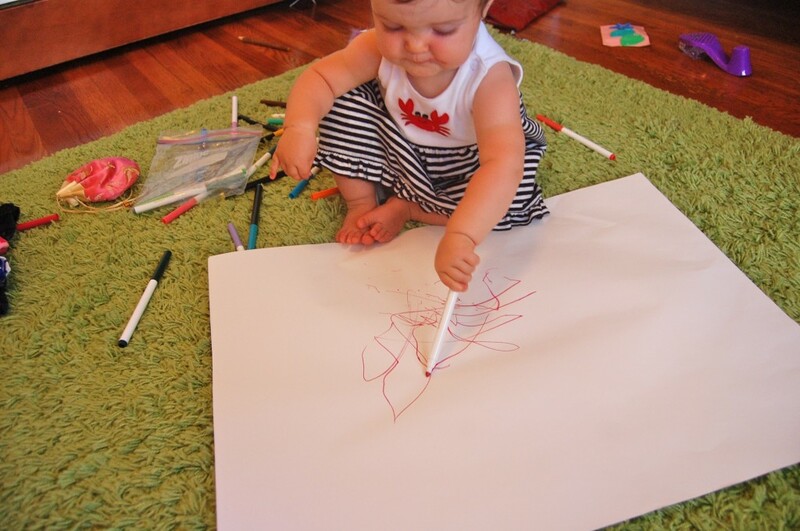 Baby Rainbow (10 months) watched my oldest, N (3 years), make drawing after drawing in her sketchbook, and then she snuck right in, took a pencil for herself, and added marks to her big sister’s sketchbook. As you can imagine, big sister was none too happy about this. 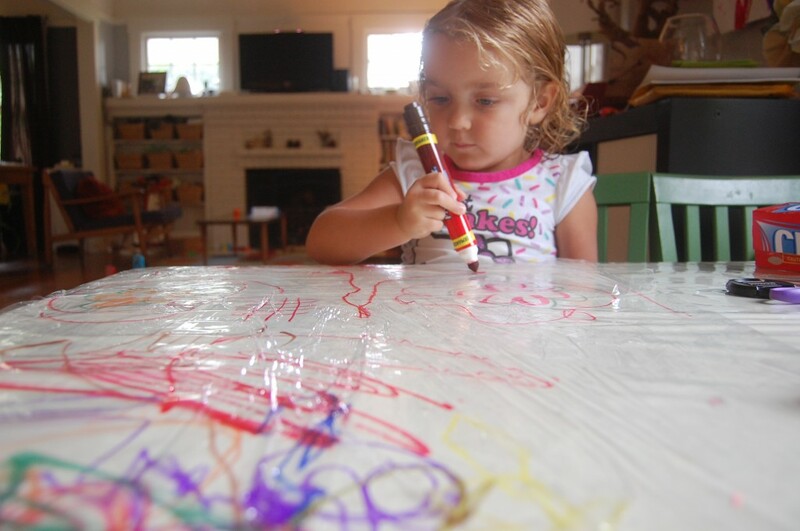 So I pulled out large sheets of paper, sat little Rainbow right in front of them, and we had two happy drawing campers. Baby Rainbow loved this! She seemed to understand that she was responsible for making the marks on her paper, in the same way that she recognizes that pushing a light switch down turns the lights out. It’s remarkable to watch these firsts, full with their “ah-hah” moments, as each succeeding experience builds on these foundations. If you have a baby and you’re thinking about this activity, I say give it a go. 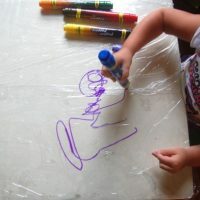 You could look for signs of interest or just go for it by setting your baby up on top of a big sheet of paper with some crayons or markers (we prefer markers because they move easily and they’re vivid — easy to use and easy to see!). 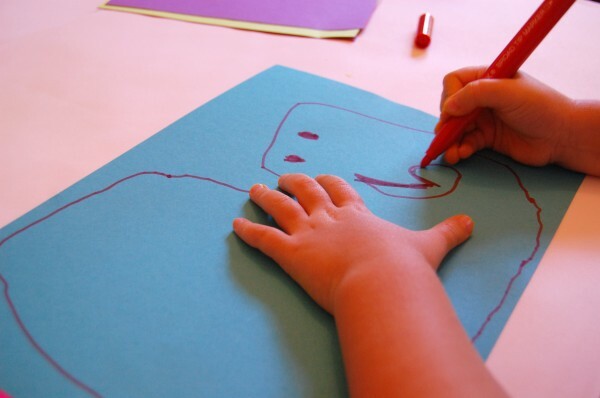 You’ll be rewarded with your child’s first drawing, something wonderful to hang on the wall, and maybe a little marker on the face (look closely and you’ll see it!). What “first” is your child currently working on?